Have a great vacation! Look me up when you get back, I'll be doing stuff on the land (on the wheeler) until the snow is too deep to get through. Safe travels. Thank you!!! I had an absolute blast down there. NC is amazing. And my Jeep handled the trip without any problems. I know not many people can take their rigs wheeling one weekend, and then go on a 2000 mile road tip the next week, so it's cool to see my Jeep serving the purpose I built it for. I even did quite a bit of wheeling down there! There are lots of good truck trails to go through, and I met a friend of a friend who was very into Samurais, he showed me lot of legal places to go, and took me through his samurai proving grounds on his property. Well let's just say the Grand surprised the both of us and made it through all of the trails without any problems! Just a few fresh dents on the doors and a broken front sway bar link, I didn't even disconnect to go through it. Camped out in the mountains for a while, went up the blue Ridge parkway, did a lot of hiking and exploring, and spent some time in Asheville too. Vacations are never long enough. Glad you had a good vacation and got to do some wheeling. Might be in the woods this weekend working and test firing the new rifle. I'll let you know if we are headed up. Cool, let me know if you do, I would love to get up there! Not a lot of opportunities left before the snow falls. Also, related to my road trip, on the way down to NC my Jeep averaged 13 mpg. Before I left for my trip back up, I took off my roof rack and KC lights and put them in the back, and averaged about 18 mpg on same roads in reverse. So needless to say, as handy as the roof rack is I am going to be selling it because that's a huge difference with the amount of driving I do lol. Have wheeled the Grand quite a bit, it's still doing great for me. Got a set of brand new retread 32s,and had to get rid of the turbine rims to get a set of ICON 16s. Put on a bugguard, put on an Upstate window banner. Also finally Swapped in a NV231 transfer case from a 2001 Cherokee to get 4 low back. Went in nice and easy, just have to adjust the Linkage a little bit. I even found the factory shift bezel from a 93 ZJ with a 231. Also upgraded to heavy duty steering, and I'll probably be taking the h cracked header out soon to get TIG welded. Probably more I've forgotten haha... I've been so busy with all my projects and things. Grand is over at Cody's getting a custom front bumper and 2x8 rock sliders. Couldn't be more excited!!!! Also put on two brand new fenders, a header panel and shorter grill from a 1994, extended brake hoses, and just got a rust and dent free hood to put on as well. Looking forward to seeing what Cody comes up with. 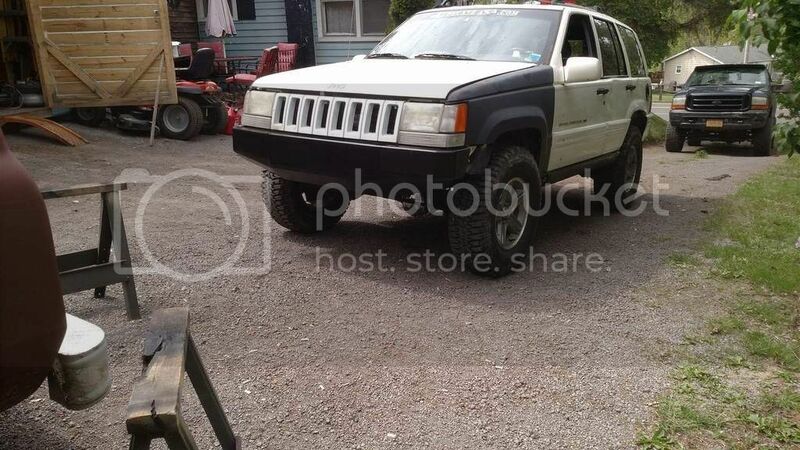 Super excited to have my zj back and I am truly impressed by Cody's work at All Terrain Innovations. He really did an awesome job on this bumper, all the small details and bends in it you would have to see in person to appreciate. I would definitely recommend him to anyone looking for any kind of metalwork or custom stuff. Going to come back soon to get some d ring tabs and maybe light tabs on it and get my rock sliders put on. So now to shake it down to see what's wrong with it after sitting all winter, and resuming where I left off on it. Front driveshaft, t case linkage, 231 shift bezel, heavy duty steering to put on, mesh inside the grill inserts, and then start moving onto bugger projects with it. Looks good. Haven't seen this in awhile. Was thinking you got rid of it.